Let’s carve it up in this killer 45 minute Spin & Sculpt with your girl, Mere W. After you get warmed up you’ll head right into a fat melting endurance interval set before heading straight uphill for a monster climb. Then to top off the ride, you’ll race to the finish before jumping to the floor. When you dismount, bring our towel, not only to soak up the sweat but also because you’ll use it as one of your sculpting tools. Just get through two 10 minute body toning blocks to fire up every major muscle group as your finale, and you’ll be feeling fat free and firm! Cut out after about 40 minutes, my connection is good. MM2019 Thanks Mere! That was a great way to wake up on a Sunday! Mm2019. I love the spin drills in this class. MM2019, spin sculpt is my new obsession! Loved it, killed it! MM2019 – Wow! That sculpting session was awesome! MM2019 Great class and balance of spin vs sculpt! MM2019 spin and sculpt with Mere, never disappoints!!! MM2019. I have noodle arms! Great whole body workout! MM2019 awesome class. Second spin sculpt that I’ve tried and I’m loving them! Mere, I really liked the towel moves! Fun class. Nice workout! Got my 😓 on. I didn’t feel like working out, but glad I did. This went quickly, phew! Great class! That towel work was harder then i expected. NYOC2019. I should know better that 4 sweat drops with Mere W. Is much harder than that! Loved everyrhing about this work out! Loved this workout so much that I did it again! #HW2019 #5 great workout Mere! HW2019-#5- I should have known the towel was evil by the way Mere W laughed about using it! HW2019 #4 done – Mere this was great! Hell Week 2019- #5 – thanks Mere! HW2019. Great class. I love spinning with Mere W.
HW2019 – Loved this class!! Enjoyed the tunes and mixing it up at the end! HW19. Gonna be sore after that one. Oh! Feels good to be back!! Awesome workout Mere!! And who knew a towel would hurt so good!! Mmc 2018 love this set! MMC2018!!! Its just a towel she said……..
MMC2018. Great combo of spin and sculpt. Last set of sculpt = ouch!! MMC2018-#13 Loved this mix of spin and sculpt! MMC2018 #11 loved this one! Not able to do the pushups as I have a slap tear that is acting up. Wow, first time working out to this class! I enjoyed it….need work on the last set though! MMC 2018 #8 + 40 push ups! MMC2018 #4. Great class Mere W! Getting stronger every minute! MMC2018 great way to start the day! Mmc 2018 #6 My arms are toast. Mmc 2018 #4. Awesome start to a Sunday! My shiuloare toast. What a great workout for days when you only have 40 min! Mere works us hard, but manageable. I love the towel aspect for a change from regular weights. It’s amazing how effective it is. I also like how fast the sets went! MMC2018 #3- great full body workout Mere W!! MMC2018- Good mix on this class with spin and sculpt! Love the shoulder burn from the towel!! Ugh! I pulled my groin doing a jump n jacks. I can’t say that has ever happened before. MCM2018 loved it!! Thanks mere! Hi Mere! Just wanted to let you know that I love your classes, and this one was great! Unfortunately I didn’t get to finish it, as I tripped over my bike during skaters and ended up with a broken ankle 🙁 Oh well, my fault for being such a klutz! Hopefully I’ll be able to finish the class in about six weeks or so! MMC2018 #1 DONE! Loved the timer/interval set up for sculpt. Going to have to remember that one for when I do my own weight workouts. MMC2018….think I found one of my new faves!! Thanks Mere! MMC2018 #1 What a great class and you had to end it with my favorite the man makers wow wow..
Great class. Loved the pace of it!!. Thanks Mere W! Love this workout!! Thanks for this total body workout I can do when I’m a little short on time! great workout, great music! I just hate it when the video keeps stumbling…Thank you, Mere! Awesome class, Mere! Loved how it flew by and kept my heart rate elevated! My towel sure felt weighted towards the end! This was amazing!! Love the towel–who knew it would feel so “heavy” !! Perfecto!! Drive to 25 #38 – Great workout again!! Absolutely love this sweat workout! I like the use of a towel and the core balance! Just getting back into the workout routine since getting over a sinus infection and this was a great one to get me back into the grove. Feeling it all, but it feel so good! Drive to 25 #27 Thanks for working all those muscles! Loved the climb! Drive to 25: 28/25- Amazed how this session flew by. Great combo of spin and sculpt. Drive to 25 #27 – Great full body workout! You ease into the hill climb interval which is killer but has recovery. Then you are off the bike to work out the rest of the muscles. Drive to 25–19 💪🏼 Thank you, Mere! Driveto25 #13. Whew! Just got back from a 10 day vacation. This one had me sweating all my sins out! Great class! Drive to 25 great class Mere! Drive to 25 #23 Gret workout!! Love this combination Mere W ! Thank you for your inspiration that keeps me on track at 63 yrs old … That 50lbs is not coming back ! Drive to 25 #31 – Love Mere’s workouts! Love her cheerful personality! Drive to 25 #21 Great class, straight to favourites, thanks Mere! Drive to 25 – Going to do that one again! Love love it!!!! One of my favorites now!!! Thanks Mere!!! Drive to 25 #40: really enjoyed the format of this class! Loved the towel exercises and tabata drills. Thx! Drive to 25 – #19 Mere’s workouts are always great! Drive to 25! Tough class! Drive to 25: yeah baby! Drive to 25 #20 💪🏼✔️Thanks Mere W! drive 25! #13 shoulders and back are talkin!! Great music! Loved the work out! drive to 25 #30 and mere´s birthday week continues…. Drive to 25…my shoulders are on fire but I loved the towel exercises!! Drive to 25.. loving the intervals..always love Meres intervals..make me feel like I can get through it.. the end drill still a tiny struggle..so tough..
Drive To 25 – 2018 #16/25 – Glad to finish this one! I really liked the format of this and will return to do this one again! During the beginning of the spin portion, I got a cramp in my hamstring (that’s never happened to me before!). I worked through the rest of the class, but I definitely favored on the side of caution when it came to using my hamstring. Determined to finish and putting the Drive in 25! Drive to 25 #11 at least I am closing hard! Great workout and great music! Drive to 25 #6 Great workout! Drive to 25#11 Great class Mere Love your hair! Drive to 25 #20 Great class! Fun music and drills! There are classes when I am happy to be at home with no one to see me…I have no balance! Doing the death lift airplane with the towel was a disaster!! Those ladies in the class looked great doing it… not me! I would end up on America’s Funniest Home Videos not on SSOD!! Drive to 25 such a great one mere!! Drive to 25 – 23. Loved it! man, that was tough. who knew a towel could give us such a burn. the spin portion just flew by! Drive to 25. 27/25😊Thanks Mere! Great class Mere! Cant’ wait to do it again! Drive to 25. Class 21✅. Great full body workout with cardio! Thanks. Drive to 25 – 2018 class #38.. Loved this class Mere Great sets both on the bike and sculpting.. Loved the use of the towel.. GREAT FUN.!! CHEERS. Drive to 25 2018 – #18 Loved it (well except for those women makers at the end) thanks Mere! Drive to 25 – #45 – love the towel drills! Thanks MereW! Drive 25-#9! Love this class, great total body workout! Drive to 25 #16. Loved, loved, loved this class Mere W. Spin was challenging and the sculpt sets kept my heart rate high as well. This one goes straight to favorites! Drive to 25 #21!!! That went by so fast! Love your classes Mere! Drive to 25 – #36. BSP.. Awesome week opener Mere. Thank you. 20 min spin with 20 min full body sculpt. Monday morning with Mere W.
Drive to 25 – great class!! Great class Mere. Loved the climb. Drive for 25:#27 (26 was Mere’s live spin yesterday). Great class! Drive to 25×16! Love your workouts Mere! Drive to 25 2018 #23 Great class! Drive to 25 #5. this is a longer one than I have been doing. Melissa here. Drive to 25 #23!! Loved the instructions, and loved the variety. Happy B’day Mere W!!! Drive to 25 #23. Great class! The sculpt was fantastic. Will definitely do again. Driveto25. Love love love the bike work then the floor. Total body workout and time flew!!! Mere never disappoints!!!! Love spin sculpt classes with Mere W. Really liked the bike intervals and the floor portion was amazing! Drive to 25 – #27;- loved that class! Drive to 25 – Great one, Mere! Loved both the spin and sculpt…tons of sweat! Thank you! Drive to 25 #15. Great class! I always love your classes Mere! Awesome way to start my Sunday! Thanks Mere W.
Drive 25 (26) great class ! Sweat was just dripping everywhere! Drive to 25 #26, loved this class mere, loved the climbs and the sculpting was really fun with the towel, great workout!! Legend! In this spectacular streaming Spin class, you’ll practice controlling your body, which often is harder than just pushing it. This sculpt and cycling class explores the element of control – using your mind to control what happens to your heart rate, your breathing, and your strength. Once the 40 minute ride is done, we’ll move to the floor for a bonus sculpting session where you can use either dumbbells or TRX as your toning tool. It’s a killer Total Body Workout. With the jams battling back and forth between Imagine Dragons and Kendrick Lamar, 2 of Cat’s favorites, you’ll be perspiring and inspiring. Leggo! Time flies & so does the sweat in this workout that no one really wants to end. One minute you’re laughing, the next you’re feeling the intensity. The sculpting begins by targeting the Chest, Back, Legs & Glutes. Later Burnout the Bis, Torch the Tris, and Conquer the Core! Fire it up! Grab your set of medium weighted dumbbells and go hard for 60 minutes. With surprise bonus burners built in (say that 10 times fast) and four 3-minute dismounts between rides, we’ll sculpt the entire body and even come back for a double down. That means that we finish with a combination round of everything we’ve done before, wrapping it up with a well earned stretch. The Spinning routines are quick and intense. Whether it be climbing, HIIT cycling drills, or speed work, your eye is on the prize: that 3-minute dismount. 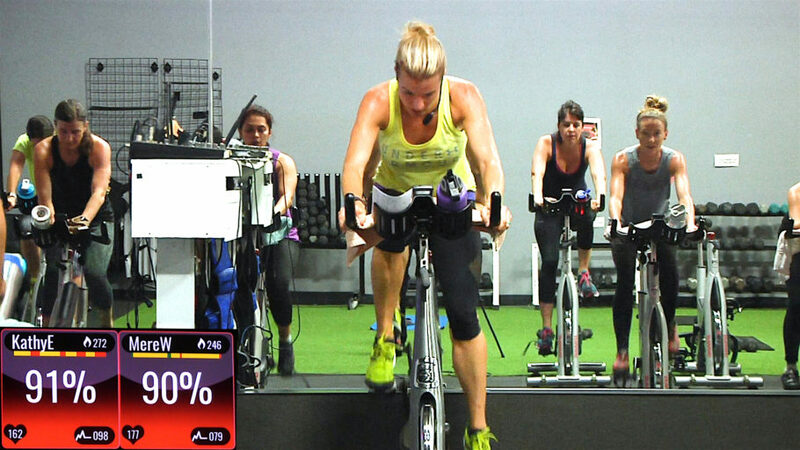 So press play and get ready to slay this amazing online cycling class with Rebecca! Sculpting sessions are focused, targeting 1 or 2 muscles at a time until they are torched! The Spin® will get you dripping with the highlight a 3-song, no break killer set early on. Music… mostly hiipp-hopp/popular. You’ll be DRENCHED after this one!